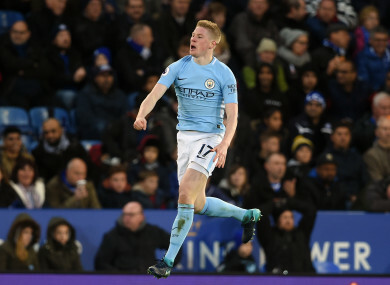 MANCHESTER CITY RETAINED control of the Premier League title race after fine goals by Gabriel Jesus and Kevin De Bruyne secured a 2-0 win at Leicester City on Saturday. Jesus and De Bruyne struck either side of half-time at the King Power Stadium as Pep Guardiola’s ruthless side registered a 16th successive victory in all competitions. City provisionally moved nine points clear at the top of the table, although Manchester United can trim their lead back to eight points if they beat Newcastle United in the day’s late game. City captain Vincent Kompany made his first league start since August following his latest calf injury, but fellow centre-back John Stones was forced off in the first half with an apparent hamstring problem. Jesus tapped in David Silva’s pass on the stroke of half-time after a slick move involving De Bruyne and Raheem Sterling. De Bruyne added a brilliant second four minutes into the second half when he completed an electrifying break by rifling a glorious left-foot shot into the top-left corner from outside the area. Email “De Bruyne integral again as Manchester City continue formidable form”. Feedback on “De Bruyne integral again as Manchester City continue formidable form”.